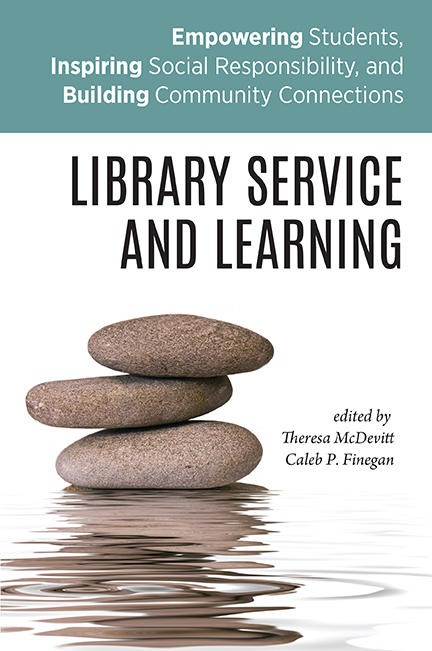 CHICAGO – The Association of College and Research Libraries (ACRL) announces the publication of “Library Service and Learning: Empowering Students, Inspiring Social Responsibility, and Building Community Connections,” edited by Theresa McDevitt and Caleb P. Finegan. This thorough book describes active teaching techniques that help build community, are relevant to students’ current lives and future career goals, and allow students to work together to solve real problems and shape their own successful and empowering learning. Service and community-based learning is one of several high-impact educational practices identified by George Kuh and the Association of American Colleges & Universities, and is increasingly seen as a vital part of the undergraduate experience. Today’s students want to work in groups, apply what they learn to real-life problems, and work in environments that are relevant and participatory. Classroom work is shifting to include more activities that are relevant to future careers, include action, and develop agency in students. Colleges and universities are actively promoting this work by including it in strategic plans, creating high impact practice-themed faculty development programs and initiatives, and offering grant funding to support their development. Divided into three comprehensive sections—Library and Information Literacy Credit-Bearing Courses or Sponsors of Undergraduate Community-Based Research; Library Support for Courses with Applied Service-Based Projects in the Disciplines; and Library as Location for Student-Led Educational Outreach Events and Projects — "Library Service and Learning" is a collection of case studies written by librarians, university faculty, and students who have successfully employed service-based or experiential learning experiences for students in higher education. Chapters include classes or programs that have been taught by or developed in collaboration with librarians and examine information literacy-related outcomes, utilize library resources, and/or take place in library facilities. Each chapter describes activities, motivations, curriculum materials, and outcomes, and appendices include assignments, rubrics, and other materials that enable you to replicate and adapt the activity to your own needs. “Library Service and Learning: Empowering Students, Inspiring Social Responsibility, and Building Community Connections” is available for purchase in print and as an ebook through the ALA Online Store; in print through Amazon.com; and by telephone order at (866) 746-7252 in the U.S. or (770) 442-8633 for international customers.